On the surface, Adventure Time is colorful, uses spunky diction, has pleasant characters, and is bite-sized. You can watch it with your mind shut off and have plenty to chew on but if you watch it with with your mind wide open, you begin to realize the wondrous underbelly of this immensely mindful iceberg. That same bite-sized, 11 minute episode, reveals it’s intention, lessons, and innocent outlook on our pre-Great-Mushroom War world. Not to sound like the Dos Equis guy, but I don’t always watch TV. I stopped watching the news many, many years ago when I realized that they only exposed the worst in humanity. Then, most TV shows, cartoons included, seem to all share the same playbook, where the flawed protagonist gets antagonized by characters who are often heavily cynical, negative, or pessimistic and this loops with each passing episode. I understand that this is the nature of entertainment, but we’re exposed to shades of this dynamic in everyday life and TV could instead give us a glimpse into a more idealistic world. To me, this is the gaping void that Adventure Time, and only Adventure Time, fills. There is such a beautifully altruistic relationship between Finn and Jake that’s as though they’re both each other’s big brother - they’re always looking after each other’s well being and happiness. This is wonderfully naive. I use this word not in the negative connotation that it’s often used in, but in the pure sense of the word in that their intentions lack malicious, conniving, or ill-willed roots. Like all the other characters in the show, no one is without flaws but more importantly, no one is oblivious to their flaws. This adds a special layer of complexity to every character and is also a great depiction that no one is inherently evil; with the exception of the Lich, who’s in a way the manifestation of evil itself. As for characters like Donny, Magic Man, Ice King, and even the exploding bosses in Dungeon Train, they all had a moment of realization of their misguided ways, and often times, they try to be better. There is really no other show that I’ve seen, current or otherwise, that presents such a profound pearl of a moral lesson in each glitter studded oyster shell of an episode. These scattered grabbles are left for the viewers to scavenge for, if they so choose. If they choose to only stare at the shell and marvel at the bizarre and relentlessly fresh surface layer of the show, then they can feast on the subtle nuances in suburb writing and animation. If AT was nothing more than this shell, I’d still be writing this letter. Jake’s “TMLO, Princess.. That means lay off.” to Princess Bubblegum to let Finn vent, or Finn’s “bon-bon” after listing two pro’s in stealing Ice King’s crown, or Finn’s “don’t lets do that again” after failing to get past the Hall of Egress, or Jake’s “I’m not sure I’m totally scoopin’ what you’re poopin” in response to Finn’s desperate comments about the Finn Sword are just some random examples of the witty writing in the show - there’s always a new way of saying something old or a cool way of saying or showing anything at all. To not gush too much about the shell, I’ll simply say that I appreciate all of it’s other subtleties: the voice acting (Mr. Fox, oh my gosh…), the characters (even one-offs like Grand Prix or no-liners like Mr. International), varied animation styles (A Glitch is a Glitch, Food Chain, or Bad Jubies), the gender reversal episodes with Cake and Fiona, the movie-esque mini-series, the quirky, often unnoticed, background music, the profound subject matters (a boy missing an arm, parallel universes, nuclear war, unfatherly father) - everything is always funky fresh and cooked to perfection. If the pearl is what you’re after, however, then you can search for the episode’s true lesson and intention. This became apparent to me when I rewatched Dungeon Train for the fourth, or so, time. From beginning to end, I saw this episode as one continuous and eloquent metaphor for corporate America. We’re unsure of the meaning of life, so we work and acquire loot in order to distract our minds from what’s real. We hate bosses yet we work to become them. Amidst the repetitive loot-obsessed craze, we forget about the people affected by our mindless pursuit and sometimes reflect, and later regret the time not spent with our families. The irony of it all is at the time I found this episode’s pearl, I was working for Apple, who’s headquartered at 1 Infinite Loop, Cupertino, CA. To me, every episode is a beautiful anecdote. Often times, I dish these anecdotes out as remedies to friends’ and families’ woes, to their dismay; here’s a small example: I was hanging out with some friends at a hookah lounge and our buddy Matt was sharing with us his frustrations of trying to change his girlfriend’s ideal breakdown in how their time should be spent (relationship vs personal time - he wanted more personal time). As soon as I opened my mouth, everyone shook their heads as they knew what was coming - an AT reference. I told him that Finn really liked Flame Princess but he knew that he couldn't change her. If he tries to dim her fire that burns him, he kills her. So, if he loved her, he would have to accept her just as she was. And so, Finn did. They played cards together with oven mitts and tin foil gloves, he would wear a tin foil suit just to hug her, and they kissed by kissing the same rock. Sometimes, I turn to specific episodes myself when I need to realign or come to terms with something. When I broke my favorite mug, a small, blue-stripped ’67 Canadian mug with a cool 2-fingered handle, I watched Puhoy, and tried yet again to understand why Jake’s mug returned to him after he had thrown it through BMO’s favorite window (I can’t tell you how many times I’ve tried solving this one because it’s my go-to reference for every time I begin regretting something, which I do oh-so often; also, I bought the same exact mug from eBay recently). When a very, very close relative died a few months ago, I put on In The Vault then continued watching AT for hours. Later that night, unable to communicate how I felt with my parents, I watched In The Vault again with them along with a few other episodes that eased my griefs. 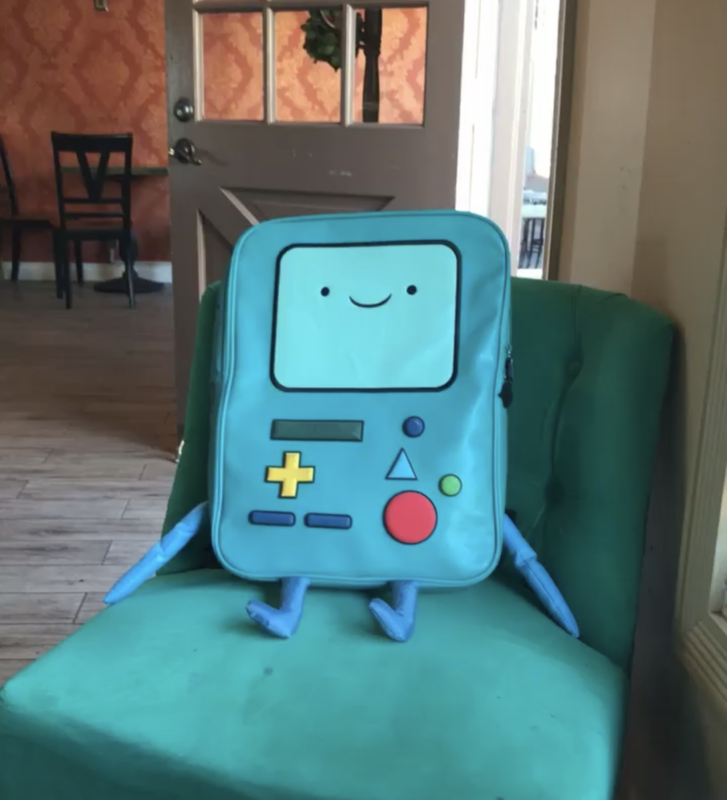 I’m 31, by the way, and I’m also sitting across my giant BMO backpack as I write this letter at a cafe. Adventure Time is truly a rare and special phenomenon that can never be recreated or imitated. It is a show that speaks to the innocent child in us. It allows us to marvel in awe without always understanding. It provides sustenance to all our senses. It is profound. If cancelling the show was a decision made and backed by you all, it’s creators, then please ignore this letter; however, if this was a logistical decision based on numbers or political doo-wop that opposes your wishes for the future of the show, then I propose we fight for what we love. I’m just a schmuck that’s deeply in love with your art and would love nothing more than to save it if saving it is what you want. More than just myself, you guys would have the faithful support of your incredibly loyal and amazing commooonity (sorry). Please feel free reach out and share any thoughts you may have about this prospect. This distinction is substantial. To me, you guys are Finn. With each episode, you allow us to see the world from your perspective: one that is simple, happy, innocent, loving, and well-intentioned. We get to gaze at our reality with the realization that it’s not all bad and that we, ultimately, have control to make things better. The void of this show, I feel, will leave us with a world of Martins.